...to update my "Padron", I was surrounded by a crowd at a trade union meeting, which represented both tram and bus drivers, who may face losing their jobs if proposed routes are cancelled. The proposals put forward by the "Generalitat" include the break up of Tam, and the speakers at the rally spoke of price rises, the inability to change from tram to bus without paying again, leading to an overall reduction in services currently provided. I had my mobile with me, so I took a couple of shots as well as a short video you can see below, so as you can see it was quite a well supported meeting, with plans of further demonstrations in Alicante tomorrow night, where a meeting is be held at the "Diputacion" in "Avd de la Estación" down from the railway station. 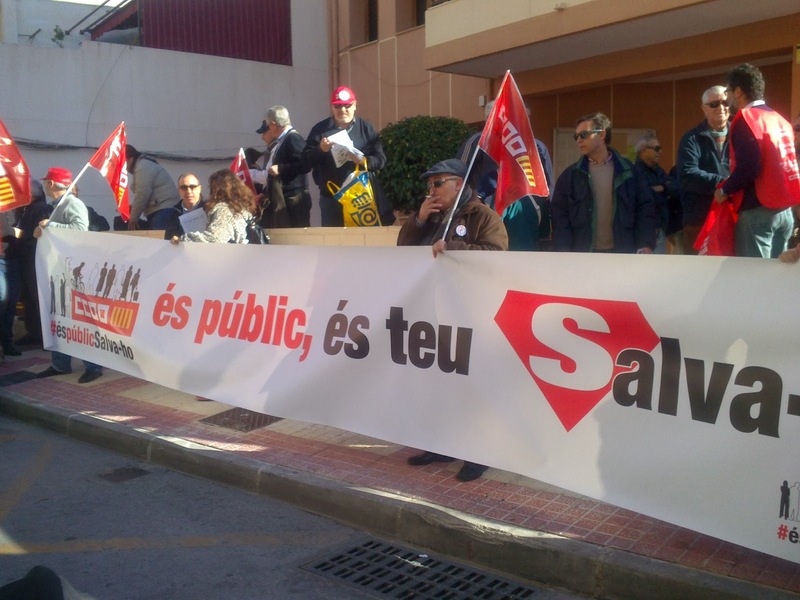 Further meetings of protest are also planned on the 11th at San Juan town hall, the 12th at the Alicante town hall, on the 13th along the "Avd de la Estacion" again, and finally a march through Alicante beginning at 18.30 from "Diputacion". It really is time to start defending the public transport services we currently have, as this type of decision making only ends up hurting those already without. With so many local people in El Campello without work, this is just like rubbing salt into the wound, so let's just hope that everything gets back to normal in Spain soon ,. and that the "Generalitat" wake up too. LATEST UPDATE: There will be a go slow service for all local buses in and around Alicante up until Christmas. Recent reviews by Andy E.
Bookmark El Campello Apartments By Andrew Edgington. Travel theme. Powered by Blogger.